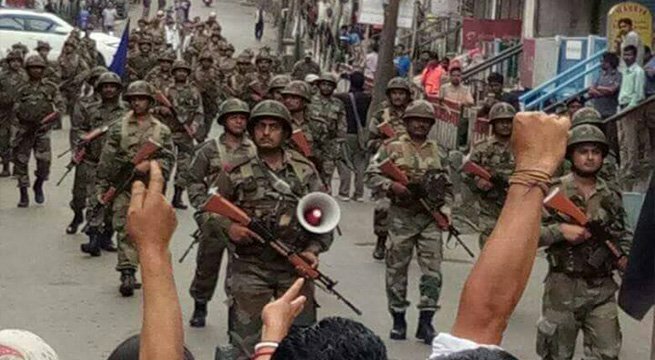 The Centre on Tuesday rushed 600 additional paramilitary personnel to Darjeeling to assist the administration in restoring normalcy and sought a detailed report on the prevailing situation in the hill district from the West Bengal government. A home ministry spokesperson said as many as 600 paramilitary personnel, including 200 women, were sent to Darjeeling. Around 400 personnel, already stationed in West Bengal, have also been deployed in Darjeeling along with the additional forces. The home ministry is closely monitoring the situation in the hill district and is ready to offer all required assistance to the state government to restore normalcy there. Yesterday miscreants vandalised government offices in Darjeeling as the Gorkha Janmukti Morcha (GJM)-sponsored indefinite shutdown forced tourists out of the picturesque hill station due to threat of violence. The Morcha, which controls the Gorkhaland Territorial Administration (GTA), has called a shutdown of all state and GTA offices to press its demand for creation of a separate state.